Hi! 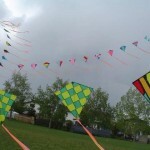 Welcome to part two of my Crazy Eddy kite arch project. If your just tuning in, check out ‘Crazy Eddy‘ to read part one in issue 36 of Kitelife. 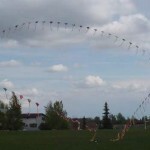 The initial Crazy Eddy kite arch is now complete. Bigger, brighter, and in triplicate to boot. 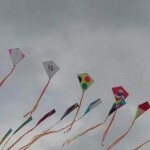 To refresh, Crazy Eddy was going to be a mere 60 kites. 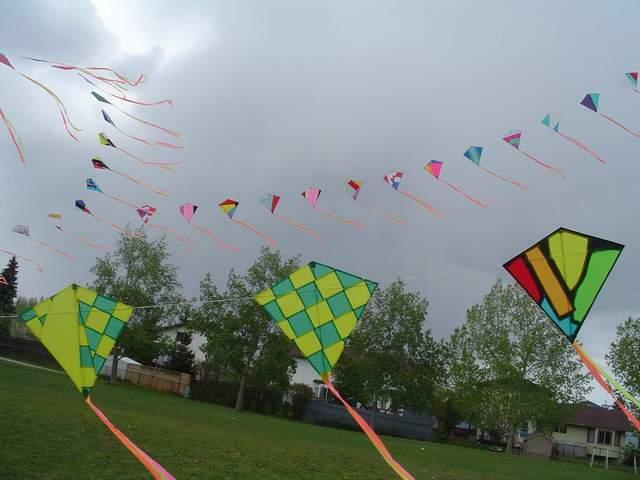 But soon after starting, I had recieved a great response from my friends in the kitebuilding community so so I upped that number to 80. That didn’t last long either. Just after submitting the first Crazy Eddy Article, I upgraded the arch yet again. 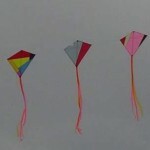 It’s final configuration consists of 3 individual archs. 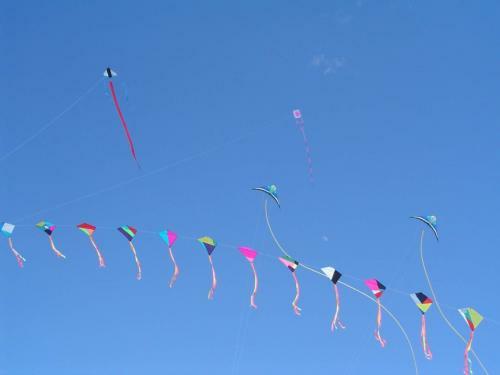 Archs 1 & 2 have 35 kites each, and arch 3 has 33 kites. 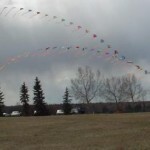 Grand total of 103 kites forming a triple stack pyramid which will forever be known as Crazy Eddy. 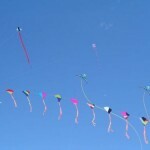 The international kite arch of fun and friends. 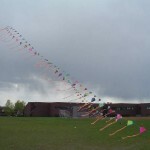 This kite arch is an example of the great things can be accomplished with nothing but good will and a bit or hard work. 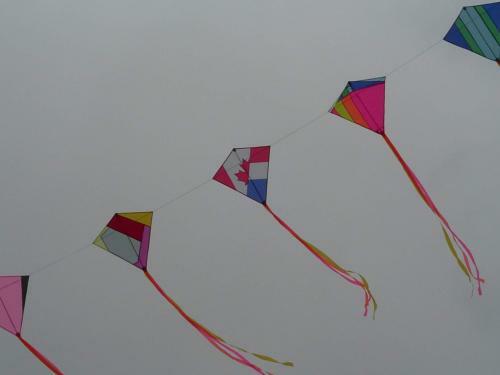 I have kites from locations spanning Canada, the USA, and from across the Big Pond in The Netherlands (that’s the half Canada half Dutch flag eddy). 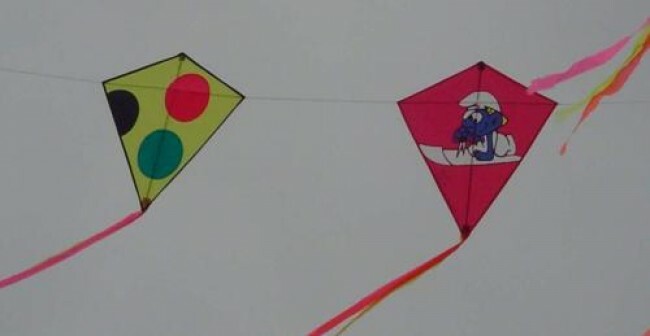 Everyone from beginners (it really was one of his first kites), to master kite builders, (and it shows in the perfect polka dots) to people who just plain like to build kites (they’re Smurf-erific!). Every time a fly this arch, I have to stand there for a while and just gaze in wonder at what a simple little question can accomplish. 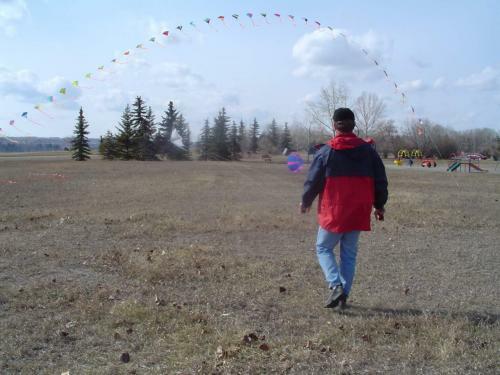 This summer, at the Pincher Creek kite festival, Crazy Eddy will be debuting as the festivals Welcome Arch. It will be flying over the main entrance to festival (as long as the wind is right 🙂 ), and the people will be driving/walking under it to enter the park. Last, but definatly not least, I’d like to make a correction in my previous article. 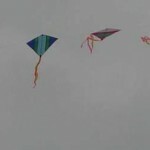 In it, I said “John Freeman had one up which contained 80 kites.”. I was mistaken. John Freeman himself sent me an email after that article and kindly corrected me. 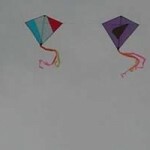 His arch has 57 kites in it. (because that’s the year he and Marzlie were married 🙂 ). * Archs are built and numbered RIGHT to LEFT. Next project for me is ‘Crazy Spike’. A 6 foot diameter ball with 12 inch spikes. It will be made from hexagons and pentagons, each in the crazy quilting pattern. Thanks for stopping by. 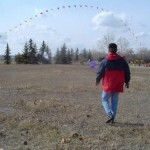 And remember, Crazy Eddy will be a forever growing kite arch. 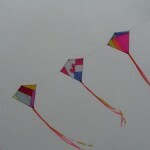 I’d ultimately like to collect kites from people all over the world. If you’d like to contribute, please contact me for shipping details. You don’t even have to worry about pockets or tails. I’ll attach those. A single Eddy skin fits quite nicely into a standard envelope. 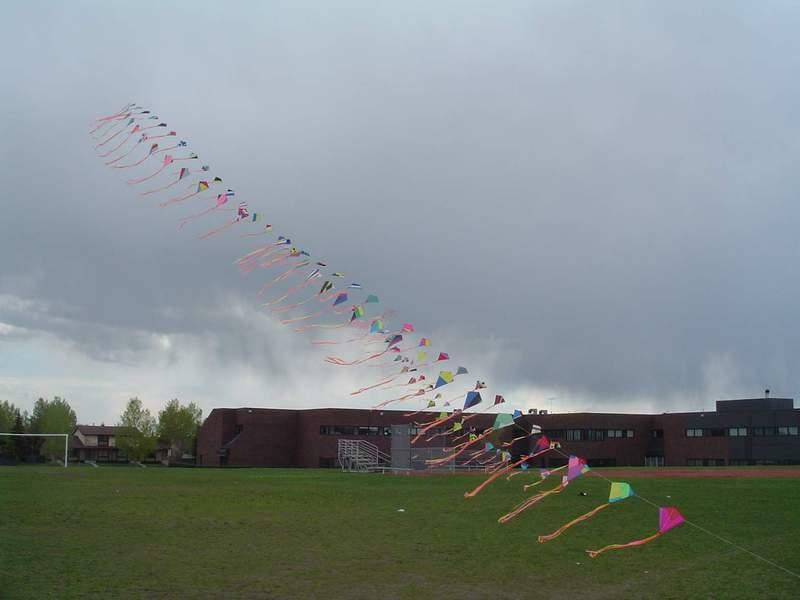 This entry was posted in 2004, Competition, General Topics, Issue 37 (Jul/Aug), Kite Making, KL Archive and tagged arch, eddy, kite making.